This roundup of 4th of July desserts will have your guests trying them out even before the party starts! If you’re looking for mouthwatering 4th of July desserts, you’ve come to the right place. Whether you want easy, kid-friendly, festive, red, white, and blue recipes, we got you covered. These desserts will simply satisfy your guests’ sweet tooth and your desire to serve patriotic and delicate sweets. Complete your buffet with any of this festive 4th of July desserts list! This hand pie recipe is very easy to make! The ingredients you basically need to prepare are refrigerated pie crusts and canned pie filling. Of course, you can always choose to make everything from scratch. To make the pies look more in-theme, you can add star cut-outs on the sides. Kids and adults alike will love these rice Krispy treats! To make these crispy goodies, you only need rice crispy cereal, marshmallow, butter, and food coloring. Parfait is a signature summer treat and for the 4th of July, this cheesecake and meringue rendition can light up your party. Only not literally as the blogger would advise you against. Check out the recipe to know why! Challenge yourself by making a creamy vanilla pannacotta, topped with delicious berries. This simple, delectable dessert hardly ever fails to please! This simple 4th of July milkshake complements nicely with fresh off the grill homemade burgers. What’s great about milkshakes is they’re very easy to prepare. Just add color to your regular vanilla ice cream shake and you’re good to go. Who can resist an Oreo? Dipped Oreos will be a hit at your 4th of July party, especially if you serve it with creamy smoothies or milkshakes. Stuff your favorite ice cream into these vibrant red, white, and blue cones. If you have kids, you can ask them to help you make these visually stunning cones. They’re very easy to make! Surprise your guests with these patriotic candy bars! Once they bite into these raspberry candy bars, they will see the touch of 4th of July. This is a simple tunnel cake recipe you can easily follow. Add bits of fruit, like strawberries and blueberries, to achieve the patriotic garnish. 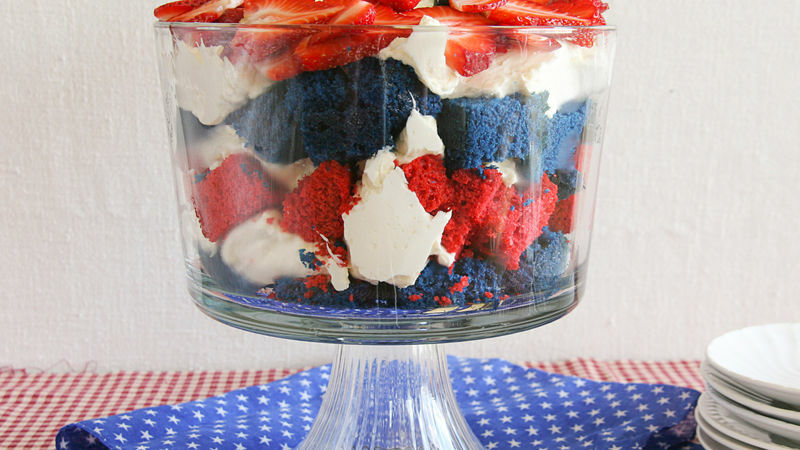 You cannot leave out one of Betty Crocker’s red, white, and blue desserts for the 4th of July. 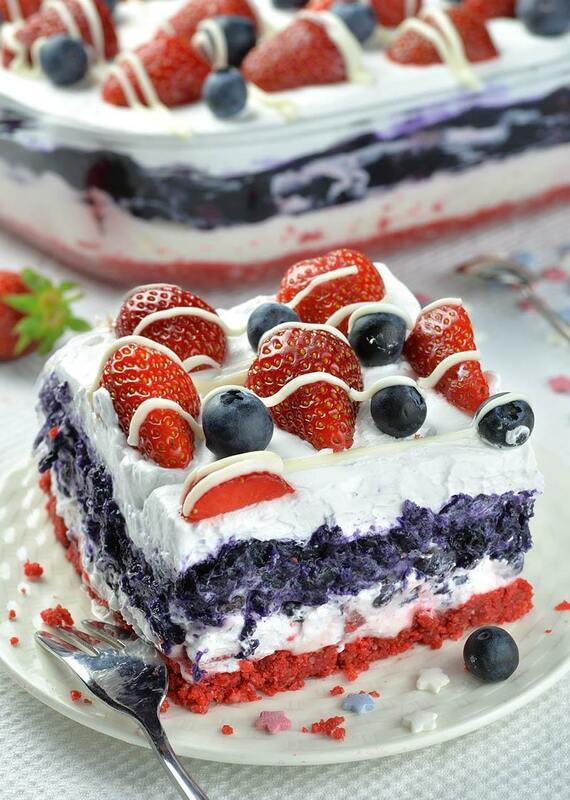 It’s amazing how a red, white, and, blue dessert can bring out patriotism in foodies. Kids will really love these yummy Jell-O treats! If you’re new to making creative desserts, this no-fuss classic treat is something you can easily do. If you’re pressed for time, just make a fruit kebab. Simply skewer some strawberries, blueberries, and marshmallows coated in chocolate and Skittles on a stick. Here’s another no-bake dessert you can make in just a few minutes! With just vanilla candy coating, crushed Oreos, butter, and sprinkles, you can make a red, white, and blue bark that can make the crowd happy. Making these star-spangled fresh berry trifles is not complicated at all. You simply have to layer colorful ingredients in a cup. The stars, which are made from pound cake, can either be store-bought or made from scratch. The 4th of July is often one of the hottest days of the year. So, be sure to stay cool with these red, white, and blue ice cream sandwiches. You can keep this patriotic punch kid-friendly, but if you spike it with vodka or rum, this punch would surely be a hit with the adults as well. Your quest for easy red, white, and blue desserts comes to an end with this no-bake summer berry lasagna dessert. It’s a super easy recipe perfect for a busy 4th of July! This decadent cheesecake cake screams the USA! To get this effect on your cake, you need to add food coloring, of course. If you don’t want to do it, you can skip this part and add fruits or more sprinkles to your cake instead. Don’t these red velvet cupcakes make great centerpieces? These lovely cupcakes would draw the crowd to your table, for sure. It will be hard to not want to finish this entire bucket of star-spangled gumdrops in one sitting. Place these little treats in colorful buckets or stylish mason jars. These American flag marshmallow pops are probably the most patriotic among all the desserts in this list. If you want to make a dessert that really goes with the 4th of July theme, make these marshmallow pops! This coconut berry icebox cake is not only delicious but it looks absolutely divine as well. If you decide to make this for the 4th of July, be sure to make plenty because people would surely ask for a second round. These patriotic popsicles are what you need to cool down on the 4th of July. You don’t have to serve the popsicles for dessert. Just keep some in your fridge in case somebody craves for a delicious frozen treat. Impress your friends and family with this American flag berry pie. Worried about spending all your time in the kitchen? It would save you plenty of time if you use store-bought pie crusts instead of making one yourself. What you need to make this very easy dessert are pretzel rods, white baking chocolate, and sprinkles. This is a simple, go-to dessert you can easily make if you have no time do a more complicated dessert. Now you know several 4th of July desserts, why not add one or two (or more!) to your menu? The crowd will surely enjoy these treats as much as we do! Enjoy a 4th of July party with your palate also treated to a whole other level! What do you think of this 4th of July desserts roundup? Which recipe are you planning to try? Share your experience with us in the comments section below! Editor’s Note: This post was originally published on June 28, 2016, and has been updated for quality and relevancy.